Urban Orienteer: Transparency and the City: Public Spaces or Forgotten Places? Transparency and the City: Public Spaces or Forgotten Places? Urban Orienteer's point of departure is the equivocal experience of feeling lost in the city, despite knowing exactly where you are. Both captivated by the urban milieu, though alienated within it, the Urban Orienteer seeks to mediate the competing demands of commitment and escape, and to negotiate the lures encountered in a frustrated search for the Outside. As a part of their program of events for the London Festival of Architecture 2010, the gallery at Alan Baxter is hosting a group exhibition which explores different conceptions of private and public space, and in particular the areas of city life where they overlap. Intended as a reflection on and engagement with contemporary discourse in Architecture & Urban Design, Transparency and the City: Public Spaces or Forgotten Places? seeks to provoke debate and to stimulate ideas amongst those interested in urbanism and the city. Multiple exposure photographs are used to present a perspective on the city that brings to mind the liberating anonymity as well as the isolation that is unique to life in the city. This individual sense of privacy is extended into the political, as lost architectural icons such as Paxton's Crystal Palace are invoked to discuss the democratic ideal of transparency and it's effect on public life. Bandstands, fading sentinels of communal space, illustrate the presence of history and memory in the life of the city, while raising questions about the changes in what community means for contemporary urban society. The co-extensive boundaries of private and public space; of interior and exterior; of the personal and the political; and of the past, present and future, result in a multivalent territory that is charged with both tensions and possibilities. The material on display derives from bodies of work that are continuing to develop, with In The Shadows of the Crystal Palace and Urban Exploration: Behind The Scene being collaborative projects in their own right. The exhibition will run from Monday 21st of June to Friday 2nd of July. Following a private view on the opening evening we will also be open to the public on Saturday 26th June. Other viewings are to be arranged by appointment. Further details here. 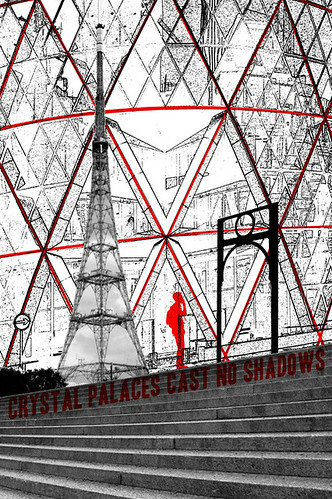 In The Shadows Of The Crystal Palace is a collaborative work in progress by Mark Oliver (Dancing Eye) and Oliver Dawkins (Urban Orienteer). The project emerged out of their research into the tensions between public and private space, and the ways that urban planning and contemporary security strategies affect the shifting territories of these spaces. Adopting an ambivalent approach to Joseph Paxton’s Crystal Palace as an architectural ideal, questions are raised on the themes of democratic transparency and territorial expansion. In developing these lines of thought, examples are drawn from the increased inclination toward the large scale use of glass in new London architectural projects such as 30 St Mary Axe (the Gherkin) opened in 2004, Broadgate Tower completed in 2009, and both Bishopsgate Tower (the Pinnacle) and the Shard of Glass which are to be completed in 2012. Each finds its precursor in Paxton’s Crystal Palace which was first erected in London’s Hyde Park to house the Great Exhibition of 1851. Recently the German philosopher Peter Sloterdijk has argued that this building can be considered paradigmatic of the project of European modernity as a whole. This, he suggests, is premised on the creation of a controlled environment which attempts to minimise the contingencies of life and subsume the outside through the creation of a commodified ‘hyper-interior’. The collaboration will culminate in the production of 6 screen-printed posters, designed to promote discussion and critical reflection on these issues and their bearing on our everyday life in London. Selected artists and writers have been invited to contribute work for inclusion on the reverse of these prints. The display of these posters will be the first public appearance of the work, with further exhibitions, talks, walks and events to take place as the project continues to develop. Practical research for this project has also taken in the production of a series of small sculptures, and a short film featuring 300 paper aeroplanes in the Turbine Hall of the Tate Modern. Collectively these will constitute the second issue of Mark's self-published DANCING EYE. Jon Spencer’s work is concerned with ideas of the layering of history; physically, emotionally and in terms of memories. Responding to the work of current London authors and psychogeographers such as Sinclair and Ackroyd, he looks to tease out stories hidden in the fabric and collective memory of the city, retelling them and prompting the viewer to look at their surrounds anew. Playing on the form of these structures, these ethereal images evoke a sense of their long lives and varied fortunes. The bandstands are recast as noble sentinels, bearing witness to the changing times around them. These are layered images, produced from a series of photographs of each bandstand - aside from the act of layering, the photographs are left unmanipulated. As with most of his work these images are produced in a systematic way - one set of rules being developed and adopted with rigorous consistency in the creation of each piece. The artist’s hope is that by adopting such a systematic approach, the city can be prompted to reveal its own stories. Two other series are currently in development, information on which can be seen on Jon’s website; The Parade and Park Benches. Christina Gestra is interested in super-imposing layers of images and playing with varying levels of transparencies. Much of her work is about enticing the viewer to take a closer look at the image in order to transform their understanding of it. The images are generally about cities - portraying the urban fabric in new and unexpected ways: taking a subject out of its usual context; playing with scales; highlighting the unnoticed; transforming a mundane scene into something potentially beautiful or quirky; cutting or fragmenting images; often incorporating text into the print and generally seeing things from a contemporary viewpoint. Much of her work uses traditional manual photography methods and experimentations with various darkroom techniques. Urban Exploration, Behind the Scene is a collaborative work by Bradley L. Garrett, John Dodd, Laura Brown, Marc Explo, Alistair Sean William Costello, Chris Reinstadtler, Arron Fulker and Danny Pack, a group of urban explorers from London and Paris. The exhibit will consist of a video installation and 14 photographs depicting infiltrated urban infrastructure, derelict places and artistic play in decaying buildings. The exhibit seeks to break apart city spectacle into the realm of the embodied by exposing the wiring behind urban façade, questioning our suppositions about the role of disused and underused urban space. The installation will showcase video footage and photographs from seemingly inaccessible places that will confront assumptions about what is and isn’t possible in the city and disrupt notions that urban life is necessarily utilitarian or impossibly overcontrolled. Urban exploration is a modern movement which challenges boundaries to locate unconventional spaces for adventurous encounter where sensual tactile sensations and heightened bodily chemical reactions dwell. What is left behind from our transgressive mobilities are just traces, ghostly whispers in playful shadows. These intangible geographical imaginations will coalesce for just moments, long enough to haunt the London Festival of Architecture, and then blend back into the night. Pieces of a London street is part of an ongoing project to document favourite spaces in the city. Taking Berwick Street in Soho as a subject, the work is not so much a survey as a documentation of personal geographies, present, remembered and historical. The drawing process allows the representation of ideas to become the means by which they are both investigated and revealed. Pinhole photos capture ephemeral human traces and the comfortable, familiar semi-public interior in relation to the territorialised and sometimes inhospitable, sometimes engaging, street. Hwei Fan is interested in the occupation of built spaces, and how architecture can act as a manifestation and record of social use, structures and change. Mark Oliver and Oliver Dawkins met while studying Philosophy at the University of London. In the years since Oliver has completed a Masters in Critical Methodology at King’s College, begun blogging as Urban Orienteer, and started to develop the use of photography within his critical practice. Mark has also recently completed a Masters in Illustration at Camberwell College, and has established a small press project called Dancing Eye. Further details of their collaboration can be found here. Jon Spencer is a photographer who originally studied Architecture at Sheffield before taking his MA at the London College of Communication. His work is centred on the idea of uncovering, unravelling and retelling the physically evident and emotionally imbued histories that lie hidden beneath the patina of the city. Christina Gestra is both a freelance photographer and chartered landscape architect. She was born, brought-up and is now based in south London, but studied up at Edinburgh College of Art, and has lived, worked and studied in both The Netherlands and Italy. Christina is also currently teaching at the London College of Communications. Bradley L. Garrett is currently researching a PhD thesis at Royal Holloway, University of London, entitled Place Hacking: tales of urban exploration. Bradley is also a documentary filmmaker and blogs regularly. Hwei Fan Liang is currently teaching on the Architecture BSc at the University of East London. Over the past four years the design unit, taught with Christian Groothuizen, has pursued interests in representation and analogue processes, and the relationships between photography, film and architecture. Hwei Fan studied at Cambridge, Kingston and UEL before going on to work in architectural practice in London.